The practice of contemporary art therapy involves reflection on multiple philosophical, theoretical and practice models, and is often dependent on a range of specific settings or populations. Yet until now the diversity of the profession has not been brought together in a single text. 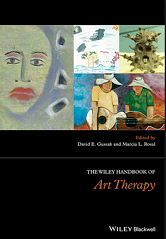 The Wiley Handbook of Art Therapy resolves the issue by providing unsurpassed breadth and depth of coverage of the subject, through a collection of theoretical and research approaches to practice. The handbook also explores various research models and professional issues, and provides a survey of global perspectives.